Some people want to entertain you. Some will encourage you. Others want to go on adventures. Adam will do all of these things, and the person who he loves to do these things for (more than anyone else in the world) is Natalie. One thing we learned about Adam during their rehearsal dinner (gorgeously planned and executed by his parents) was that he is known for many things: goofy feats with his buddies, planning elaborate birthday adventures for others, and using adjectives like they're free. But one thing that he's most known for is the way he dotes on Natalie. He tells anyone in earshot how gorgeous she is at every second that he can. You can read about how the wedding weekend began with a private rehearsal dinner banquet at The Corinthian (one of Houston's finest locations in historic downtown) and how the wedding day began at the Omni Hotel in our first blog post about Natalie and Adam. Memorial Drive United Methodist Church is a towering grey brick church in Houston, TX. Its modern, expressionist stained-glass windows line the sanctuary, and they cast a golden glow over everyone when the sun is just right in the late afternoon and early evening. Natalie and her mother arrived from the hotel by limousine to this sunny view of the church steeple. 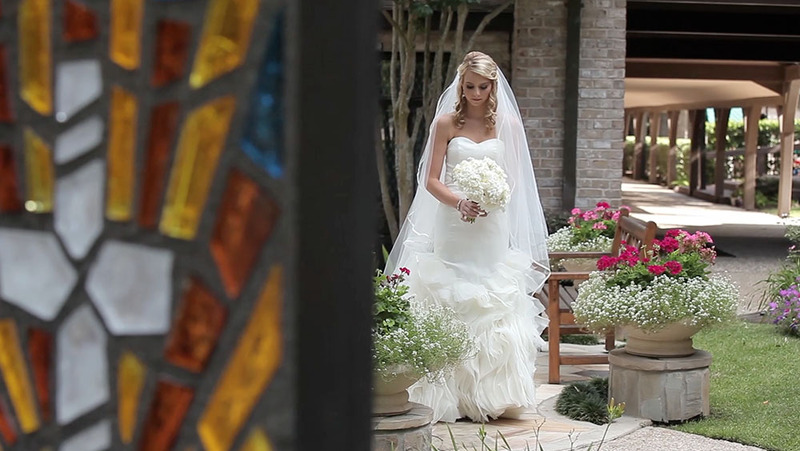 Natalie and Adam broke tradition and kept it at the same time---they chose not to have a first look, but they did want to have a brief second to meet for a quiet moment alone before the ceremony began. The church has a prayer garden with gorgeous stained-glass sculptures that form a privacy wall. 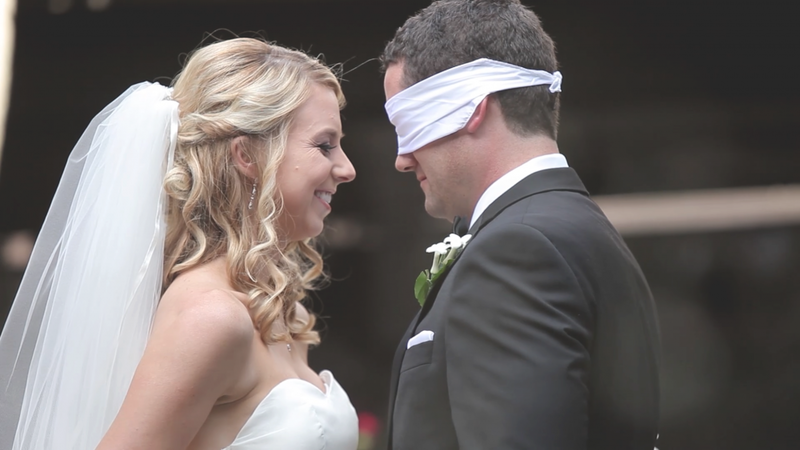 Natalie waited there for Adam while he was blindfolded for their meeting. A wedding day can often be filled with a flurry of activity, and it is important to us to allow our clients to feel they have room to breathe in any moment where they have an opportunity to be quiet. We love to film these kind of moments from a little ways back to give the couple a sense of privacy while they speak to each other for the first time. Our microphones and long-range lenses pick up those sweet words that are said and close up images perfectly for the edited film, and this allows us to keep the more quiet and intimate experiences of the day feeling very precious for the couple. , plus it had a cowboy hat on top! They also had a photobooth provided by Image Cinema to grab some fun and quirky images of their guests, too. At the wedding reception, Natalie's maid of honor spoke of how she had traveled the world with Natalie on many adventures. She congratulated her on having a new partner for adventures, and we join her in that sentiment!